Oh my bacon! Chicken, cheese and hot sauce. 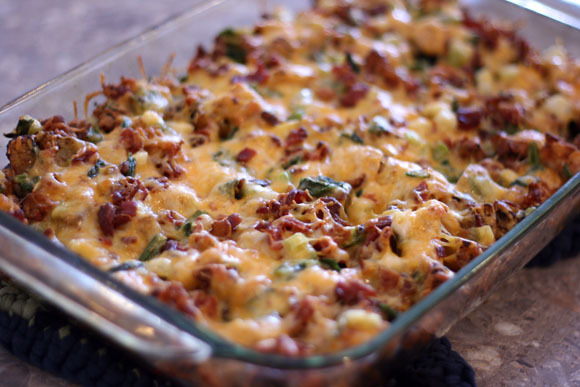 Tons of deliciousness all piled into one casserole. Whisk together the oil, salt, pepper, paprika, garlic powder and hot sauce in a large bowl. Toss in the cubed potatoes and coat with the mixture. Using a slotted spoon, transfer to a lightly greased casserole dish. Bake, stirring every 15 minutes until browned and crisp, about 45-50 minutes. While the potatoes are in the oven, add the chicken to the bowl the potatoes were in and toss to coat. Cook the bacon, drain on paper towels and crumble. 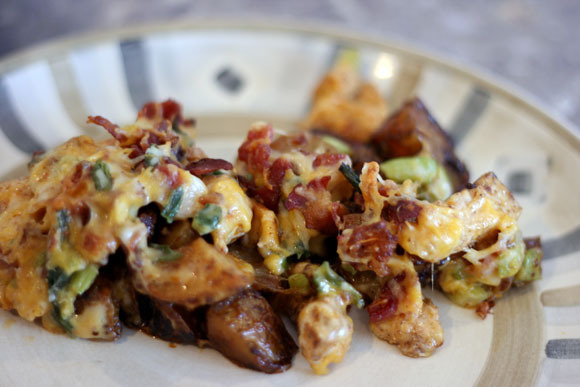 Combine the cheese, bacon and green onions together in a bowl. When the potatoes are cooked, top with the chicken and bacon mixture. Lower the oven temperature to 400°F. Bake for an additional 15 minutes to cook the chicken and melt the cheese.